Jazz Whittaker, P.K. Yonge, senior: The two-time Sun Girls Tennis Player of the Year turned in another strong season by winning her third straight District 4-1A title and advancing to the state quarterfinals in No. 1 singles and doubles. Kiah Turner, P.K. Yonge, junior: Posted a 9-1 record at No. 2 singles, claiming district and regional championships for the Blue Wave. Was a state semifinalist in singles play and teamed with Whittaker in No. 1 doubles. Kendal Wilby, Buchholz, freshman: Compiled an 11-1 record in her first year with the Bobcats, including a district title win in No. 1 singles and doubles. Advanced to the Class 4A state meet as an individual and in doubles with Courtney Cribb. Abigail Vlasak, Oak Hall, sophomore: The District 4-1A runner-up in both No. 1 singles and doubles for the second-place Eagles. Won her singles match at regionals. Went 7-1 during the regular season in singles play and 5-1 in doubles. Emily Louie-Meadors, Eastside, freshman: The District 5-2A champion in No. 1 singles and doubles. 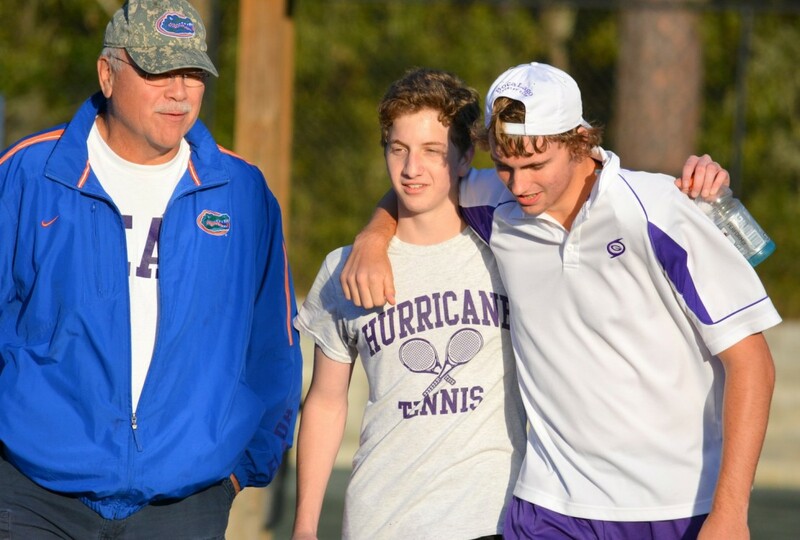 Went 11-3 in singles play and reached the Class 2A state quarterfinals. Was a state semifinalist in No. 1 doubles with Allie Sourakov. Allie Sourakov, Eastside: junior: Finished with a 10-3 record this season and claimed district titles in No. 2 singles and No. 1 doubles. Went 12-2 overall in doubles play with Louie-Meadors before losing in the state semifinals. Courtney Cribb, Buchholz, junior: The District 1-4A champion at No. 2 singles and No. 1 doubles. Helped lead Bobcats to their 12th district title in 13 seasons with her 10-2 singles record. Lauren Blakely, Buchholz, senior: Went undefeated during her final regular season with the Bobcats. Earned district title at No. 3 singles. Madison Sagas, P.K. Yonge, eighth grade: The district finalist finished with a 6-3 record at No. 4 singles. Paired with eighth-grader Marcela Ifju to win the District 4-1A title in No. 2 doubles. Selin Yaylali, Oak Hall, seventh grade: The District 4-1A runner-up at both No. 2 singles and doubles. Posted an 8-1 singles mark during the regular season. Won her singles match at regionals. Gaelin McLeod, Oak Hall, sophomore: Claimed the District 4-1A title at No. 3 singles and was runner-up at No. 2 doubles. Was undefeated during the regular season in both singles (7-0) and doubles (6-0) play. Serena Colton Stark, Newberry, senior: Compiled a 6-1 record at No. 1 singles in her final season with the Panthers. Honorable mention: Marcela Ifju, P.K. Yonge, eighth grade; Darby Townsend, P.K. Yonge, freshman; Gaelin McLeod, Oak Hall, sophomore; Lillie Mehan, Buchholz, sophomore; Maggie Bethea, Buchholz, sophomore; Madison Parenti, Gainesville, senior; Sarah Lima, Gainesville, senior; Heather Borah, Santa Fe, junior. The Blue Wave continued their run of success in the postseason this year with a sixth straight district championship and second consecutive berth to the Class 1A state tournament. Taylor guided P.K. Yonge to a 9-4 record this season, despite having two eighth graders and a freshman among his top-five players. The Blue Wave finished eighth overall at the state meet, highlighted by Turner’s semifinals berth in No. 2 singles. Zach Goldberg, Gainesville, senior: The Class 3A No. 1 team singles state champion posted a 22-1 record this season and also claimed Class 3A district and regional titles. The four-time all-area selection teamed with Peter Slaton in No. 1 doubles to win district and regional championships. The duo finished as Class 3A state runner-up. Cole Fiegel, Gainesville, senior: The District 5-3A and Region 3-3A champion finished as the Class 3A state runner-up in No. 2 singles with a 22-1 record. Was second at state tourney in No. 2 doubles while playing with Jacob Gordon. The pair also claimed district and regional titles. Peter Slaton, Gainesville, junior: Won second-straight Class 3A No. 3 singles state title and finished with a 22-1 overall record. Also claimed district and regional titles this season. Hyunsoo Joo, Eastside, freshman: Turned in an 11-8 record at No. 1 singles en route to the District 5-2A and Region 3-2A titles. Teamed with Camille Kima to win No. 1 doubles at district and regional championships. Samuel Cockey, Eastside, freshman: District 5-2A and Region 3-2A champion at No. 2 singles. Paired with EHS sophomore Derek Li to claim No. 2 doubles title at both districts and regionals. Logan Blaser, Oak Hall, sophomore: Finished with an 11-3 mark this season as the Eagles’ No. 1 singles player and team captain. Capped season with District 4-1A title. Jacob Gordon, Gainesville, junior: The Hurricanes’ No. 4 singles player captured the District 5-3A and Region 3-3A titles and finished his season with a 17-6 overall record. Max Portillo, P.K. Yonge, sophomore: The District 4-1A champion in No. 2 singles finished his season with a 8-3 record. Camille Kima, Eastside, sophomore: Won both district and regional championships for EHS while competing at No. 3 singles. Maxwell Curtis, Eastside, junior: Helped Eastside advance to Class 2A state meet behind his district and regional titles at No. 4 singles. Tabong Kima, Eastside, senior: District 5-2A and Region 3-2A champion at No. 5 singles. D.J. Mayer, Keystone Heights, sophomore: Posted a 10-1 record in No. 3 singles play this year to improve to 20-1 over the last two seasons. Teamed with Jared Velazquez for an 11-0 mark at No. 2 doubles in 2013. Honorable mention: Sam Perelman, Buchholz, junior; Peyton Nimmons, Buchholz, junior; Andrew Irani, Buchholz, sophomore; Nick Gallman, Santa Fe, senior; Shri-Ram Poddar, Santa Fe, junior; Jared Velasquez, Keystone Heights, sophomore; Grant McGee, Keystone Heights, junior. Spradling guided the Hurricanes to a 19-0 mark this season, capped by his team’s runner-up finish and a pair of individual championships at the Class 3A state meet. Gainesville also captured a Region 3-2A title and won its third straight district championship under Spradling’s watch. While the longtime GHS coach narrowly missed adding his third overall state title trophy, he has earned Sun Coach of the Year honors in each of the last three seasons.